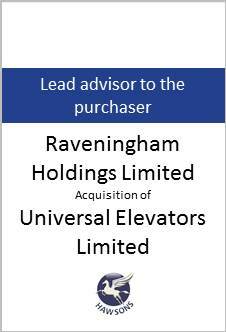 The Hawsons specialist corporate finance team have assisted Raveningham Holdings Limited, as lead advisors in the purchase of Universal Elevators Limited. This is the second time we have worked closely with Raveningham following their acquisition of Classic Lifts in 2010. We were delighted in having assisted Raveningham, as lead advisors to the purchase, on their very important acquisition of Kent-based Universal Elevators. In 2010, Hawsons advised Raveningham Holdings Limited complete its acquisition of Classic Lifts; a company which is expanding year on year and now has 3 branches, in Haydock, Sheffield and Leicester. The acquisition of Universal Elevators is the latest stage in a plan to expand its business development nationwide. Universal Elevators is a Kent-based company that specialises in the maintenance, repair, modernisation and installation of all types of passenger lifts and goods lifts. The acquisition gives Raveningham a Southern-base, adding to its divisions across the North of England.